For example, non-organic potatoes are treated with fungicides during the growing season, then sprayed with herbicides at harvest time. Then more fungicides to stop the ‘eyes’ sprouting. This extends the shelf life in supermarkets, to boost profits at the expense of your health. Aside from the chemicals, conventional crops are often nutrient-deficient. Farmers focus on N-P-K (Nitrogen-Phosphorus-Potassium) fertilisers. 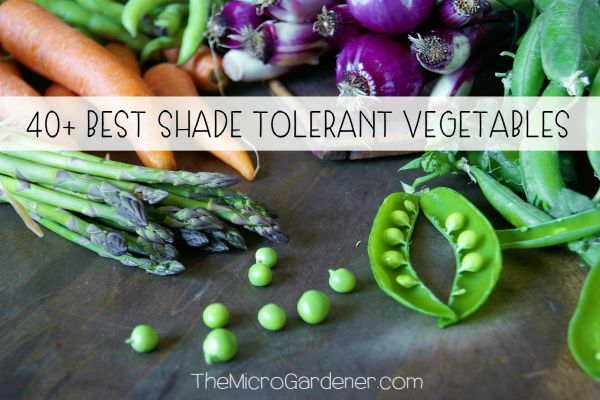 However, these create weaker plants because minor minerals and trace elements are overlooked. That means chemically-grown plants are lacking ALL the minerals required for plant and human health. 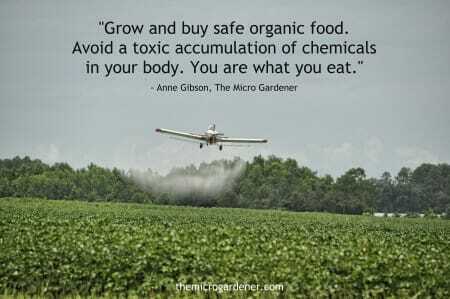 If you are not yet growing your own food, consider supporting your local organic growers or retailers. Or join a local gardening, seed saving, crop swap or Permaculture group. 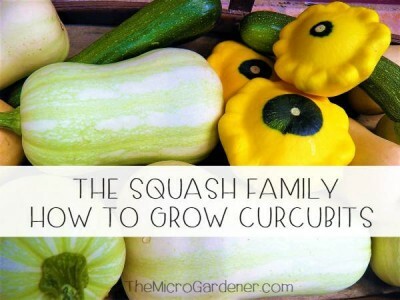 Members often swap/share home grown produce. A healthy diet starts with eating and growing safe food. If growing from seed, use certified organic or heirloom, GMO-free seed and plant material. Then you know you’re eating safe food. I propagate free food regularly from my own garden. 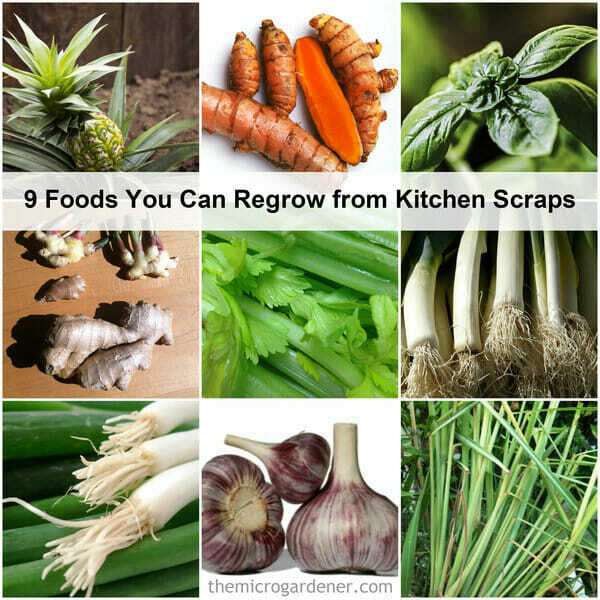 Why not give these foods you can regrow a try too? 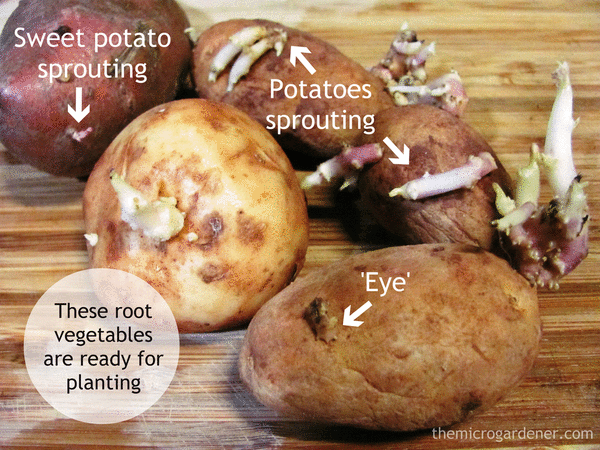 Potatoes develop ‘eyes’ or sprouts. These eventually grow into stems and leaves. Once potatoes start sprouting, they go past being edible. That’s nature telling you they’re ready for planting! Bury the sprouted tuber deep in your soil with some compost. Mulch well and keep watered. Keep covering the stems as they grow. This helps encourage more potatoes/sweet potatoes to grow. Depending on the variety, one potato or sweet potato can yield you a minimum of 1kg+ of free home grown food. My sweet potatoes are often 1-2kg each. Not a bad return on investment! 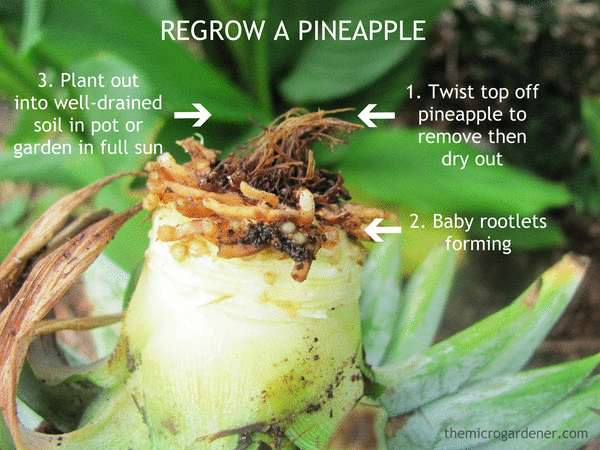 Growing a new plant from a fresh pineapple is just so easy! Twist the top gently off a ripe pineapple. You may need gloves, as the leaves are spiky! Then remove a few small leaves from the base or under side of the leafy top. You will see small brown hard ‘dots’ or ‘rootlets’ appear. Dry this leaf section out for a few days, so it won’t rot. Then replant it in well-drained soil in full sun. Roots will develop. In time, a new plant will grow. Pineapples are very slow growing, but are very drought hardy. It takes 18 months – 2 years until they fruit. The plant will also produce slips and suckers. These produce more new fruit in 18 months. Beautiful flowers form before fruit. Water your plant well initially, add mulch and organic slow release fertiliser or compost. Apply liquid seaweed every fortnight until it is established. Then be patient! The sweet reward will be worth it. Do you have unused garlic cloves? Don’t waste them! Separate each clove from the bulb and plant individually. Each clove will yield one new bulb. A great value investment. For an easy tutorial, see my 5 Step Guide to Growing Gorgeous Garlic. If you buy leeks, select those that have the roots left ON. Cut the leek about 2cm above the roots and use the stem in your cooking. Soak the remaining root end in water overnight. When the leek re-shoots, plant deeply, making sure to build up a little hill around the base. Put a stake in to keep the plant stable and watch the leek grow again. When it flowers and forms seeds, save these and you will have more leeks to grow again for free! If you are harvesting leeks from your garden, leave the root in the soil. Use a knife to slice the base of the stem. Keep watered and you’ll have a new leek in far less time than growing from scratch. Have you ever bought a bunch, only to find they are still in the fridge days later going waste? 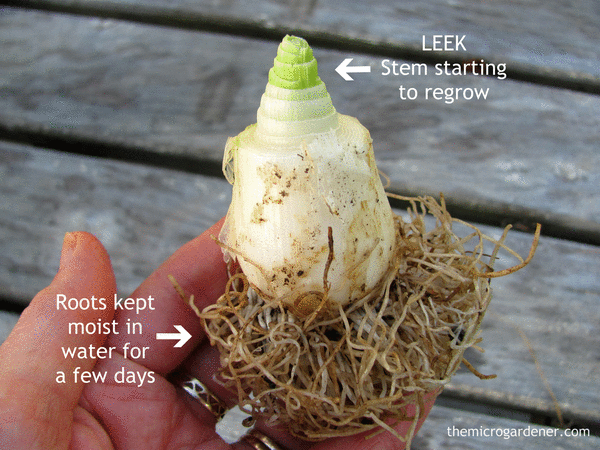 Just like leeks, if you trim the white stem about 4-5cm above the roots, it will regrow. Put spring onion/shallots/scallions/green onion stems into a glass of water in a well-lit spot. Refresh water daily. The stems will re-shoot in just days. Enjoy this delicious herb in your meals right from your kitchen bench or plant out in the garden. Follow my easy Guide to Growing Spring Onions tutorial for more tips. 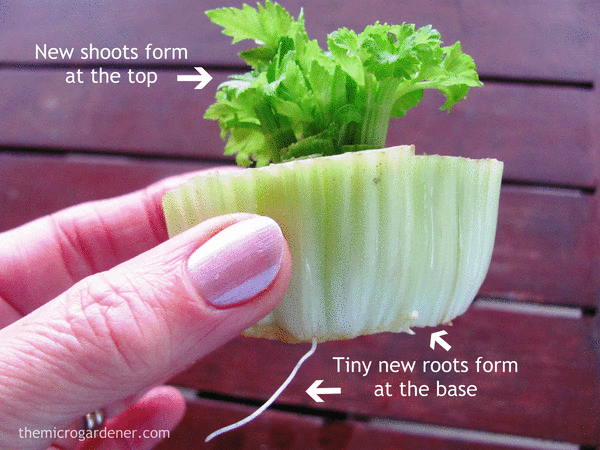 Did you know celery will regrow if cut above the base of the stalks? Add the cut base to warm water in a shallow dish for a few days in a sunny spot. Wait until roots and new tiny leaves appear. Then plant out into well composted soil. Mulch and water well. Celery needs a moist, sunny position and will keep you in luscious salad leaves for months. This fragrant herb is a favourite in Asian cuisine and herbal teas. Buy organic lemongrass stalks that still have a small root at the base. Avoid those that are trimmed off. After you have used the top, more leaves can regrow! Put the stem in a glass or jar with a small amount of water to cover the root. Place in the sun until the plant re-shoots new leaves. Keep fresh water topped up. Plant out in your garden. Lemongrass also makes a wonderful fragrant, pest-repellent mulch. Both these root vegetables can be grown from a rhizome or piece from a larger knob. Each ‘thumb’ piece should have two ‘eyes’ or buds developing. 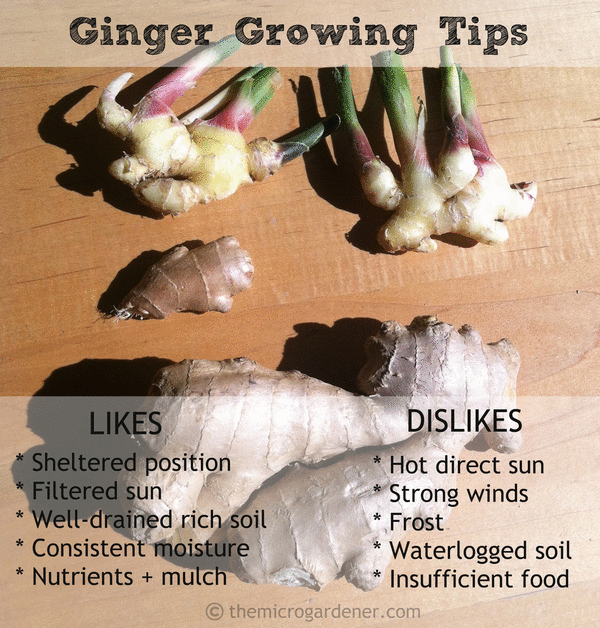 Push the piece of ginger or turmeric gently into well-drained soil about 5cm (2 in) deep. Lightly cover with mulch. Position the buds facing upwards so these will grow shoots. The best time to plant is in spring. Both appreciate some shade protection in warm climates. After 8-10 months, the plants will develop many new roots that you can break off. Enjoy using these, sell them or save more for replanting. Basil is sucha popular herb and is so easy to regrow. Just put the stem into a glass of water in a well-lit position. Make sure no leaves are below the water line. After the stem starts to grow new roots, transplant into a pot or your garden to grow a new basil plant. 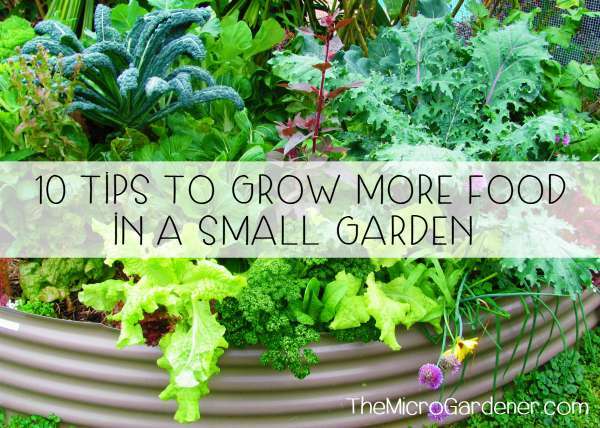 There are lots more foods you can regrow and ways to save money on plants. Check out my article ‘Frugal Gardening – How to Get Plants for Free’ for more ideas! One thing to keep in mind is that organic vegetables also make great compost – so you if can’t grow something new and fresh out of them, you can always add them to your compost pile. As indicated by the EPA, we discard 96 billion pounds of nourishment consistently. 96 Billion! That is more than 25% of the sustenance we plan! There is no compelling reason to put kitchen scraps, garbage mail, envelopes, and daily papers into our landfills. As landfills keep on growing, reusing and fertilizing the soil is ending up more critical to every one of us separately. 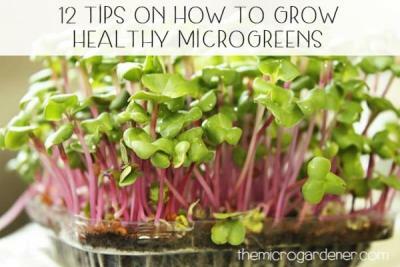 Hi, only just came across this fascinating information, I’ve been growing fruit and veg for years but still learning, thank you so much, I’m particularly interested in microgreens after sprouting mung beans and alfalfa for years! Thanks for letting me know you enjoyed the article. I have a HUGE LIBRARY of free articles you’re welcome to dig into. 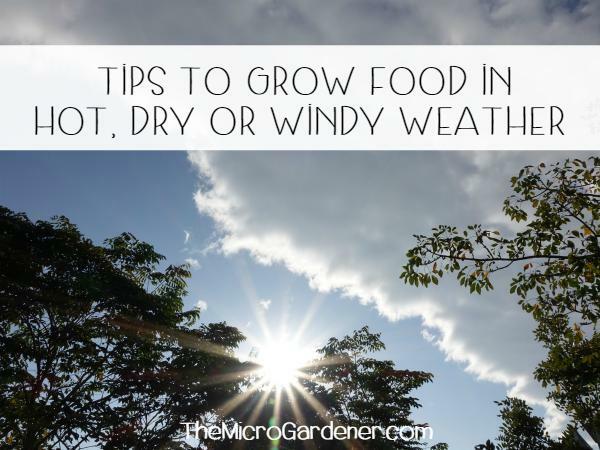 I invite you to JOIN MY NEWSLETTER for more free monthly tips on how to grow a nutrient-dense food garden for health and wellbeing. Here’s a sample newsletter to check out. You may also enjoy HOW TO GARDEN ON YOUR BENCHTOP – GROW SPROUTS! and my EASY GUIDE TO GROWING MICROGREENS. Thank you Anne – have saved these tips & will try it for myself as soon as weather is right. I’m glad you found these tips helpful Valerie. Perfect time for gardening by the moon right now – plant out any above ground rooted cuttings or plant pieces. e.g. spring onions or divide your lemon grass. Happy gardening!